That would be Needlework in War-Time: Dressmaking, which appears to be subject eleven in a course issued by The Royal School of Needlework. Yes, there’s a Royal School of Needlework. It’s a real thing. In fact, I heard it mentioned on Call the Midwife the other day, which made me absurdly excited and caused me to explain to the television that I have one of their things. The television, you’ll be sad to hear, was not interested, and the cats probably thought I was promising them food some time within the next two seconds. The whole publication is a mystery. It looks newer than it supposedly is and it does not have the feel of something printed during the Second World War. And when you spend most of your time in op shops, carefully assessing if something looks genuinely old or not, you develop a completely useless knack of estimating the age of paper. There’s next to no information about this publication, but it seems to be part of a correspondence course in sewing almost anything you can imagine. I managed to pick up the dressmaking issue, but I’ve missed out on such treasures as Lingerie Making, Suggestions For Teaching Beginners Or Convalescents, Church Work and Renovating, which actually has nothing to do with turning your spare bedroom into a Beauty and the Beast-style library and more to do with repairing worn-out elbows on coats. The thing that fascinated me most was the introduction to dressmaking, and not just because it refers to ‘making their own underwear’, which is how they seem to describe anything worn under coats (ie. ‘outerwear’). The primary aims and objects of these correspondence lessons is to form a band of members all over England capable of making their own underwear, and transforming unneeded garments for themselves and their children and so using up all materials which come to hand instead of buying. In other words conforming to the declared wishes of those responsible for England’s war effort. As a secondary object “Needlework in War-time” aims at helping those whose thoughts are constantly with their men on active service, whose vivid imagination pictures tragedy whenever their minds are not fully occupied. We have all been knitting for our men and will continue to do so, but knitting becomes mechanical and does not require thought to drive our flying fingers. We need some occupation that temporarily absorbs our minds entirely and this we find in needlework of all kinds. I have the entire medical profession with me, I believe, when I say that working out an intricate design is the best possible remedy for over-strained nerves—for it is literally fascinating and all worries are forgotten for the time being. The Royal School of Needlework will be pleased to supply members with embroidery wools, silks and cottons, also designs, and offers individual help to all those who encounter difficulties. 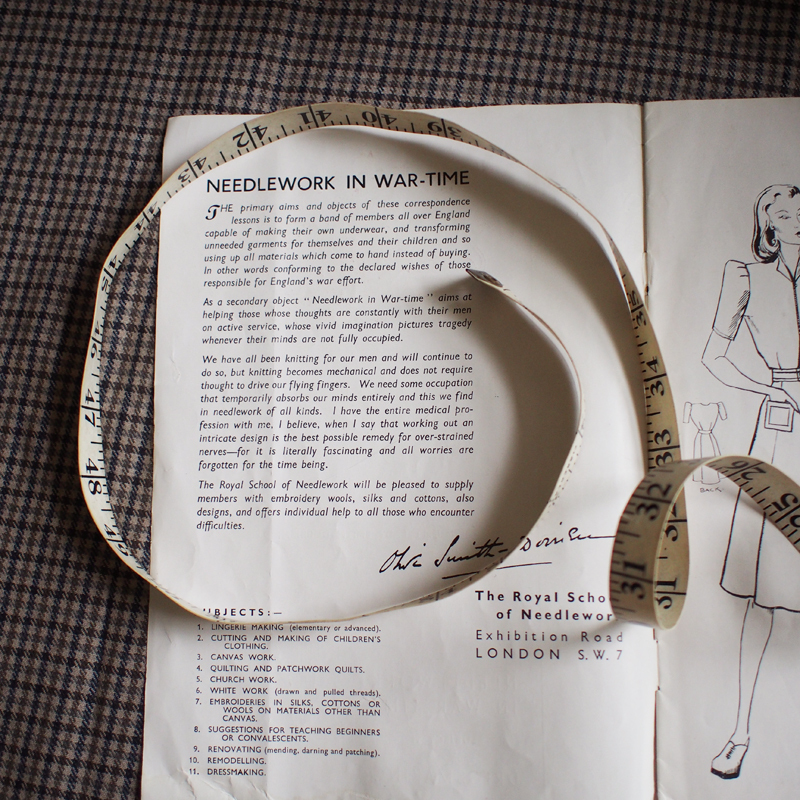 When we think of dressmaking during the war, I’m sure we bring to mind images of women turning last year’s dresses into this year’s skirts, or embracing the ‘Make Do and Mend’ mentality. I’ve never thought about it as a technique for keeping your mind off the worries that would otherwise plague you. It would work, too, as I’m sure any amateur dressmaker would agree. When you discover you’ve been diligently sewing the wrong pieces together or your bobbin runs out half way through sewing a zip, your thoughts are definitely distracted and tend towards incoherent rage and a fond desire for your sewing machine to spontaneously implode. 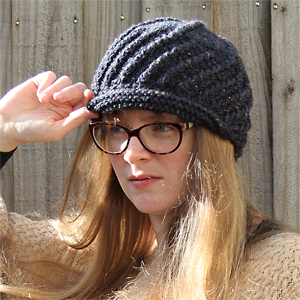 Knitting is soothing; sewing invokes extreme emotions you didn’t even know you possessed. So there you have it: a simple glimpse into why the Make Do and Mend mentality was useful on more than one level. Stay tuned for more Take Me Back Tuesday fun soon. Will we venture into the Library of Shenanigans or is it time to see if potatoes really belong in a recipe for chocolate chip biscuits? Only time will tell! Hahaha – what an entertaining read! Thanks for making my morning a more pleasant one. Fascinating that doctors at the time recommended sewing to distract the mind and reduce stress- current research in mental health/ happiness/ ageing advocates for learning a craft/ hobby – such as sewing!- to busy the mind, to get lost in ” the flow” of an activity, where you are enjoyably absorbed and loose track of time…turns out what was a good idea back in the 30′ & 40’s is still a great idea, now supported by research! It truly is fascinating! No wonder sewing is so popular now – it’s a great way to pull yourself away from the non-stop distractions of television and social media. We’re fortunate in that most of us don’t need to distract ourselves from loved ones in war zones but I think many of us are benefiting from having that space away from technology. Irony-clad because we seem to use that same social media to communicate about it. So true! There’s only so much restful isolation we can take before we have to tell someone all about the things we’ve been making. 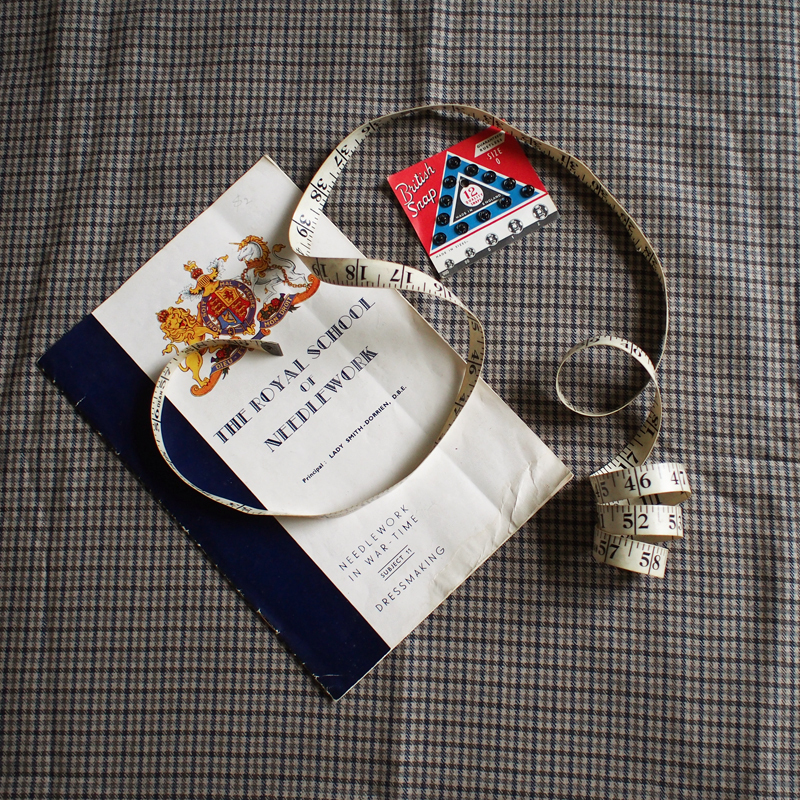 “a band of members all over England capable of making their own underwear”…. BEST BAND EVER. It summons up quite the image, doesn’t it? Oh, do you know, I saw the picture that said “Royal Academy of Needle work” and got ridiculously excited and spoke to my computer too (it didn’t care either), so if I were you I probably would have danced one of those little foot-hops that two year olds do while pointing and stuttering like an overgrown version of the same when it was mentioned on the TV. And they’re so right!! Needlework is a brilliant activity for soothing anxiety most of the time. Except, as you say, in those moments when you realise that you’ve just been sewing things together back the front and will need to spend the next four hours unpicking the damned thing. But that’s when it’s REALLY handy to have things that need breaking around. Or wood that needs chopping for the fire. Oh yes – it definitely helps to have something in which you can channel the rage that comes from doing something catastrophic while sewing. Any carrots lying around should watch out because they’re about to be chopped up in the most vengeful manner possible. And yet, sewing is still serving its purpose of distracting us from other matters.